At OCCC, accommodations are made for people with physical disabilities. Some of those are ramps, handicap parking and specially-designed desks and water fountains for those in wheelchairs or for those who may have trouble walking. However, said Jenna Howard, licensed counselor and social worker in Student Support Services, some students have disabilities that aren’t as readily seen and those students need a helping hand as well. Mental health disablilties are just as debilitating as physical ones, Howard said, and there is no shame in seeking help. “We have two counselors on campus ready to assist students with these issues,” she said. Sometimes, Howard said, a student may not even realize there is a problem, but she said her office can help them identify if there is. “Many young people do not discover they have a mental health disability until they are in their early 20s,” she said. She said some students with mental health disabilities function well without additional assistance but said she is willing to help the ones who feel they need it. Tori Leon, psychology major, said because of her major, she is well aware some students may have a mental disability, but was unaware there are resources on campus to assist those students. “Many times people do think about students having mental disabilities, only the physical ones, but I am glad to hear that they are not being left out,” Leon said. 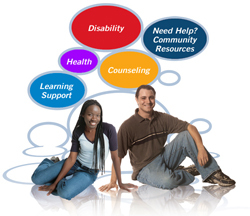 Howard said Student Support services can assist students with long-term and short-term counseling. She said it is impossible to know exactly how many students at OCCC suffer from some type of mental health disability because not everyone seeks help. “Some students are too embarrassed to come forward about problems they may be having mentally,” she said. Howard said she wants to encourage those who feel something may be wrong to visit her office located on the first floor of the Main Building for help. “We have the resources here on campus to help those in need,” she said. “If we cannot help someone, we can point them in the right direction and refer them to someone who can help them,” she said. For more information, e-mail Howard at or call 405-682-1611, ext. 7621.